Near and dear to my heart, BC Rich guitars took the spirit of "before its time" the Gibson Guitar Company showed in the '50s and turned on the turbocharger. While the Gibson Explorer and Flying V gave guitarists wild designs, they were tame compared to the insane good looks of the B.C. Rich Mockingbird, Bich and Eagle. BC Rich guitars were the creation of founder Bernardo Rico (Bernie), a Flamenco acoustic guitar player from Los Angeles, California. He had a shop there in LA where he made Flamenco guitars. In 1969, he decided to try his hand at building electric guitars and basses. His inspirational models? The Gibson EB-3 bass and the Les Paul. Get more BC Rich Guitars history here. The first original design came out in 1972. It was called the Seagull, and while it had a unique body design, it is reminiscent of the Les Paul. It also had another unique feature - the neck-through body. Basically, the guitar neck runs the full length of the guitar to the end of the body, rather than being glued or bolted on the body. Instead, two "wings" are glued on either side of the neck. The pickups and the bridge are on the same piece(s) of wood as the tuners and fingerboard. The idea is to help increase sustain and tone quality, as the strings are stretched over a solid piece of wood without any glue joints or bolts to potentially affect the tone of the guitar. You also benefit in a more comfortable and accessible neck joint where it meets the body. When these were introduced, they were particularly special because they were all hand made. Each were made with maple necks and usually a mahogany body. Active electronics were installed, including a preamp, Varitone switch, phase switch and coil splitters (to give access to a single coil pickup tone). Also featured was a 24 fret neck, so you got a full two octaves of playability. When I first became aware of BC Rich guitars around 1980, I saw Craig Chaquico of Jefferson Starship playing a purple Mockingbird, and I thought the design was incredible. Pat Benatar was also big at the time, and Neil Geraldo (lead guitar) played BC Riches. I used to look through mail order catalogs for the BC Riches. A brand new Mockingbird or Bich would cost you $1100, which was way out of range for a high school kid. Compare that to today, something coming from the Custom Shop can easily cost you $4000 and up. 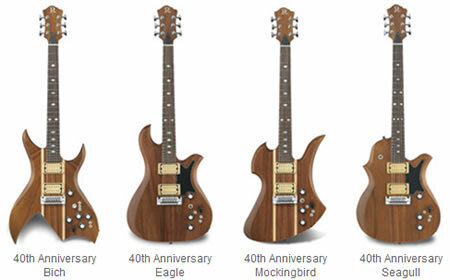 In fact, the 40th anniversary models retailed for $5400 (each limited to only 40 built). Unfortunately, unless you can find a vintage model for a good price, you'll have to spend the money to get the hand-made quality if you want one. The early hand made guitars had thinner bodies than the Korean made NJ series guitars you can get today (NJ stood for Nagoya, Japan, where the NJ Series was originally manufactured, not New Jersey as it was commonly thought). While I enjoy my NJ series Bich, it is much heavier than the late-70's Mockingbird - I estimate it's probably a quarter inch thicker than the hand-made models. The manufactured models of today don't come with all the electronics either. You have a basic setup with volume for both pickups and a single treble pot, plus your pickup selector switch. The extreme low-end Bronze Series guitars feature a bolt-on neck and pretty low quality hardware. I have a Bronze series Mockingbird that doesn't stay in tune very well. I think if I changed out the tuners it would perform better, but as a first guitar for my daughter, it works alright. When the 80s hit, B.C. Rich introduced the Warlock, which was a big hit with hair metal bands. Most of the newer designs like the Beast, Warbeast and Wraith are played today by metal guitarists. In fact, Kerry King of Slayer plays a number of BC Rich guitars. He has worked extensively with B.C. Rich to create signature models of the V, the Beast V, the Metal Master (Warlock design). Check out all the designs on the Kerry King section of the B.C. Rich site. If you find yourself interested in getting a BC Rich guitar, inevitably you'll find someone mention poor quality issues with the brand. Unfortunately, there is truth to the claims. As Bernie grew the business, he eventually farmed out marketing of the line, allowing another company (Class Axe) to move the foreign-produced versions of the guitars. While he bought back the rights to his designs in 1993, the damage had been done to the company's reputation. As I mentioned before, if you want the legendary B.C. Rich quality, either you get your hands on a vintage (pre-1989) model, or you shell out the cash for something out of the custom shop. The active electronics, neck-through body and hand crafting make these pretty special guitars. If you want to check out a load of video demos of the classic models, head over to Vintage B.C. Rich Maniacs. There's Seagulls, Mockingbirds, Eagles and Biches galore. The NJ Classic models of today are decent mid-level guitars - heavier than the hand-mades, with a thicker body and a wider neck. That's probably the lowest price point I would go with a BC Rich guitar, though. The Masterpiece and Bronze Series models have bolt-on necks and lower quality hardware - I wouldn't bother with them unless you enjoy frustration! BC Rich Guitars still has a lot to offer. While it's not the same company Bernie envisioned and built, there's a viability that can't be denied. When top-notch axe masters like Kerry King and Slash lend their names and reputations to the line, count on there being an instrument worthy of that distinction.